If your pet isn't as agile as he'd like to be, getting up to those spots he loves so much can be tricky. Some dogs are sensitive about up into your car so you might be looking for the solution. And some pets are simply too small to get up to the places they want to be! 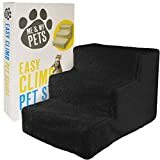 It may also be that you aren't as able to lift your dog up and you need a little backup. Owners who are recovering from operations find dog steps invaluable while they get back to full health. Putting your dog in control can be the key to a happier pooch, and dog steps are a great way to give them access in a safe, autonomous manner. Plus there are some fantastic designs that fold down to be stowed away safely in between uses. There are ramps on the market but some users report that they are too narrow, slippery and cumbersome to move around. The best designs are portable and lightweight so that you can move them from house to car with ease. Plus you can tuck them away into your boot when you're travelling in case there are any access issues while you're away on holiday. 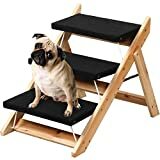 If your dog loves curling up on your bed but has been struggling to jump up there recently, he'll love having his own little stairway to heaven. And if he's struggling to get on your bed, chances are he's finding access to your car tricky, too. Some owners also use steps to give their dog access to the garden if there's a drop between decking or doors. 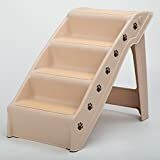 A set of dog steps is a great reward for a faithful pup who has lofty ambitions! Your pup might be a little wary of this new toy at first (especially if he's a larger breed), so it's important to introduce them gently. You can try using little treats for every step up he takes until he's confident that they can hold him and that he's not going to topple off. You may find that descent is a little harder for him at first so be patient and give him time to get comfortable. He might take a little while to get used to it but soon his dog steps will be his favourite possession. 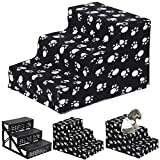 If you are looking for a budget set of dog steps, you can get good designs for between £20-£30. But in this bracket, you'll probably find that the steps aren't collapsible so they might take up a little storage space. This might not a problem at home but if you want to take them away with you, they might take up some boot space. However, head up towards the £40 mark and you'll be treated to little extras such as designs that fold flat, have deluxe coverings and feature attractive patterns. Most designs will require a little self-assembly. 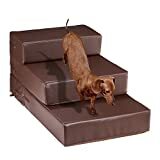 For a seriously smooth climb, check out a great alternative to dog steps - a dog ramp.